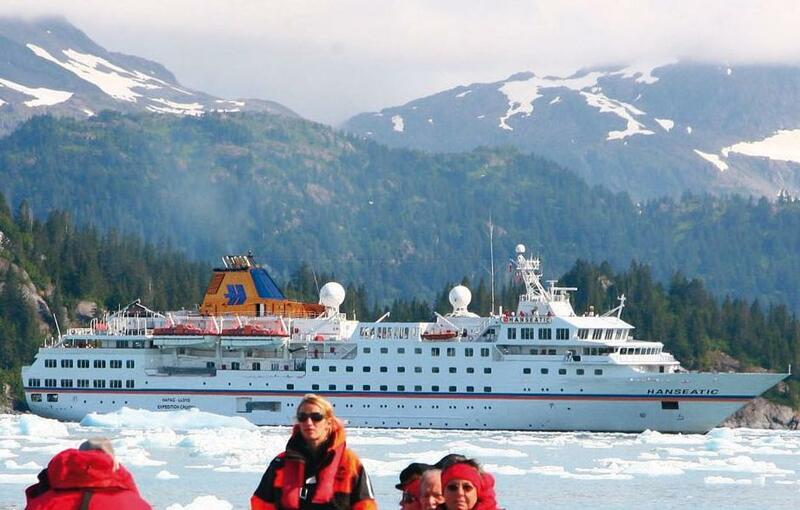 Hapag-Lloyd Cruises offers two expedition trips through Alaska in the Summer of 2012 and Summer of 2013 on board the MS Hanseatic and MS Bremen. 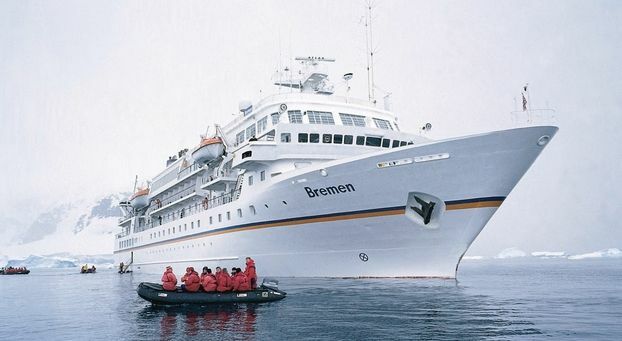 The 184-guest Hanseatic , the world’s only 5-star expedition ship and the 4-star 164-guest Bremen (Berlitz Complete Guide to Cruising & Cruise Ships), were created to provide intensive exploration in the most elegant surroundings for only a small number of passengers. The Summer of 2012: Hanseatic sets sail in July through the legendary Inside Passage of Alaska, considered one of the most beautiful waterwayes in the world. Guests can book the following excursions : a glacier flight, a dogsled trip, a boat trip and hike in the rainforest, a helicopter flight over the glaciers and a ride with the historic White Pass & Yukon Route narrow gauge railway. Guests will encounter Tracy Arm, perhaps Alaska’s most beautiful fjord, with fabulous views of her steep rock walls. Hanseatic will also travel through the Kingdom of Bears and Bald Eagles, where guests may be able to catch sight of whales and sea lions in an impressive natural setting. Additionally, an excursion to Tongass National Park will offer guests insight into the flora and fauna of the largest national park in the US. Voyage Details: From July 14-20, 2012, from Seward, Alaska, to Vancouver BC, fares for this itinerary start at £4,700 per person. The Summer of 2013: Bremen set sails for Alaska in June 2013, with a shorter trip through the Inside Passage, highlighting more of the Alaskan islands along the route. Guests will be able to observe colonies of fur seals, while kittiwakes and guillemots circle the seemingly endless sky over the solitary waters on this itinerary. Guests may also catch a glimpse of the impressive bald eagle along the route. An optional excursion to Dutch Harbour is also offered, where passengers can visit the oldest Russian Orthodox church in North America. The Bremen will get close to the wonders of Alaska, in Amalik and Kukak Bays, where powerful brown bears hunt for food. An overwhelming world of ice awaits guests in front of the still active Hubbard Glacier, as well as magnificent landscape views and whale spotting when Bremen sails through the Inian Pass. 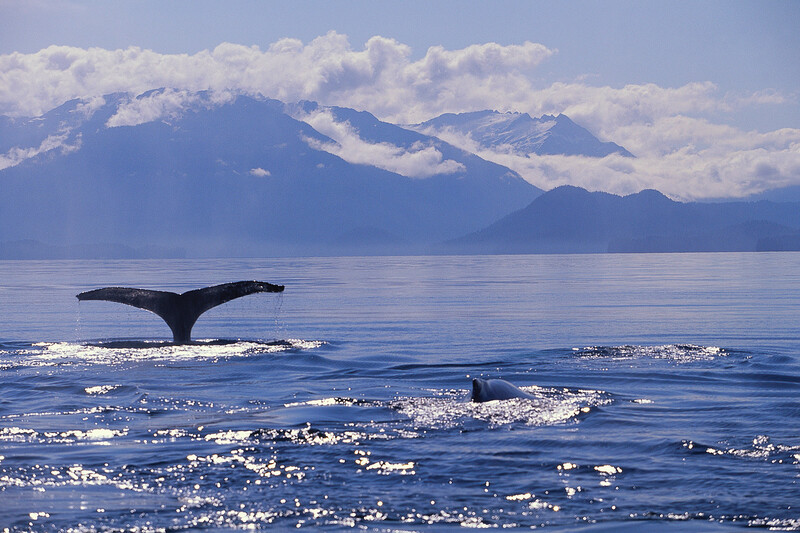 This voyage concludes with two days through British Columbia’s Inside Passage. Voyage Details: From June 19-July 7, 2013, from Nome, Alaska, to Vancouver BC, fares for this itinerary start at £5,710 per person. Both ships are well equipped for travel in difficult waters, holding the highest ice class ranking for passenger vessels (E4). Also shallow drafts and high manoeuvrability allow the ships to enter waters larger cruise vessels cannot reach. Guests explore the world’s best-kept secrets in zodiacs (small motorized boats) with only 10-12 guests. On-board experts include a team of experienced scientists, expedition leaders and specialists who guide landings and offer guests the rare opportunity to observe plant and animal life up close. The captains guiding the vessels have together already travelled to the Arctic and Antarctica more than 200 times. For further details on any Hapag-Lloyd Cruises departure please call Gay Scruton at The Cruise People Ltd in London on 020 7723 2450 or e-mail cruise@cruisepeople.co.uk. Hapag-Lloyd Cruises is pleased to announce the availability of yet another Alaska cruise for International clients, where all services will be provided in both English and German, including all menus, daily programs, lectures etc. Take advantage of this cruise at the height of the Alaskan summer to marvel at the mountains, glaciers, forests, fjords and wildlife – indeed, the sheer rugged wilderness of Alaska! July 15 – 29, 2012 – 14 days from Seward, Alaska, to Vancouver, BC. July 18-25 – Alaska’s Inside Passage: Pelican (at anchor), cruising off Point Adolphus, calling Juneau, Skagway (at anchor), cruising Tracy Arm, Frederick Sound and Chatham Strait, calling Petersburg, Ketchikan (at anchor), cruising in Misty Fjord) – what a lot we do and see this week! All outside cabins, fares include gratuities, minibar and port charges. Early Booking Reduction: Book by December 17, 2011, and receive a full 5% fare reduction. For more information on Hapag-Lloyd Cruises’ exciting Alaska and other itineraries please visit www.hl-cruises.com. For bookings, enquiries or brochures please call Gay Scruton at The Cruise People Ltd in London on 020 7723 2450 or e-mail cruise@cruisepeople.co.uk.